HOMEREDI has always been focused in empowering Home Buyers and Home Owners with a Quick, Easy and an Affordable approach for choosing a single Licensed, Insured and a Reliable company for all their home services and renovation needs. 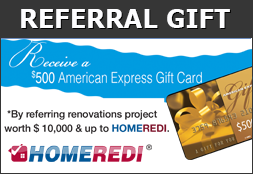 HOMEREDI comprehensive service offering has specifically been designed to meet your home services needs such as Clean-ups, Repairs, System Upgrades, Restoration and Remodeling needs. Install Crown & Base moldings. Convert old Radiator Heating to new Baseboard Heaters. Install Hi-Hats & light fixtures. Interior Renovation (Kitchens, Bathrooms, Entry Foyer, Den, Family Room, Playrooms, Mud Rooms, Basements & much more).